Sandside Lodge is a special school catering for pupils aged between two and nineteen who have a statement of Special Educational Needs or an Education Health and Care Plan. All pupils have learning difficulties and many have additional and complex needs such as autism, physical disabilities and sensory impairments. Members of this year’s team are currently either completing their Foundation Degree in Garden and Landscape Design or in their 2nd year of BSc (Hons) Landscape Management Degree. Each team member has brought individual talents to the team and has worked on different elements of the show garden, which will be displayed at RHS Flower Show, Tatton Park which is running from Wednesday 19th July to Sunday 23rd July 2017. Level 3 sports turf apprentices had the chance to see two golf courses at either end of the spectrum during an educational visit during National Apprenticeship Week. Stephen Charles (Frodsham Golf Club), Tom Sheridan (Vicars Cross Golf Club), Chris Brayford (Harper Adams University) and Peter Lewis (Royal Liverpool Golf Club), accompanied by Peter Knight (Reaseheath Welfare Officer) and Lyndon Smith (Horticulture Assessor) first visited a course under construction at JCB’s World HQ in Uttoxeter. The apprentices enjoyed a guided tour with Course Manager Euan Grant and shared JCB’s vision of a £30 million world class tournament venue, which is due for completion in 2018. They then moved on to well established Ashbourne Golf Club in Derbyshire, where they looked at efficient and effective management with Course Manager Richard Walker. Level 3 Horticulture, Floristry and Environmental Art students join with Manchester Metropolitan University (MMU) trainee business teachers to start up mini enterprise businesses to raise money for RAG week. Level 3 Students and Secondary Business trainees. Three PGCE Business trainees from the MMU Cheshire campus recently organised Enterprise workshops for 30 of our Level 3 Horticulture, Environmental Art and Floristry students. The sessions were delivered over three days focusing on marketing, setting up a mini enterprise business, how to ‘pitch’ an idea to investors and finance. The students were split into five groups with business enterprise themes based around a college dating agency, selling plants, stone decorating, stationery and selling sweets. In true ‘Apprentice’ style themes were judged by a panel of university and college staff and prizes awarded for best display stand, overall profit made and overall business idea. Now in its third year, this joint project aims to provide students with valuable skills in team working, problem solving and enterprise skills. Benefits to the students include the chance gain additional experience to discuss at job interviews and the opportunity to work and teach alongside colleagues. Reaseheath RAG also gained from the enterprise profits with £173.36 going towards our nominated charity, British Heart Foundation. A good experience all round! Three talented Reaseheath students proved they were among the best in the country by successfully competing in the WorldSkills UK national finals. Garden landscaper Chris Shore and florists Fiona Davies and Robyn Longden battled it out in front of record crowds last week at The Skills Show, the nation’s largest skills and careers event. Although none brought back a medal, all three classed the show ‘an amazing experience’ and Robyn has been selected to join the potential squad for the next WorldSkills GB team. She and the other young people on the long list will be offered further training opportunities before final selection nearer the 2017 world finals, which will be held in Abu Dhabi. Robyn will be encouraged to follow in the footsteps of Matt Beesley, a former Level 3 Diploma in Horticulture student who, with fellow team member Jonathan Gill from Northern Ireland, won GB’s first ever medal in landscape gardening at the WorldSkills final in Sao Paulo, Brazil this summer. Robyn is a Level 3 Diploma in Floristry student while Fiona, who manages our Level 2 Diploma in Floristry course, is studying for her Level 5 Master Diploma in Professional Floristry. Chris has gained his Level 3 Diploma in Horticulture with us and has now progressed onto his Foundation Degree in Garden and Landscape Design. He was one of just six students or apprentices nationwide to qualify for the finals. Our florists had to create five designs – a hand tied bouquet, a wreath, a bridal bouquet, a decorated lampshade and a pair of customised high heeled shoes – while Chris built a garden to plan which included hard and soft landscaping. As well as supporting our competing students, we also took an impressive stand showcasing horticulture, floristry, countryside and environmental archaeology. 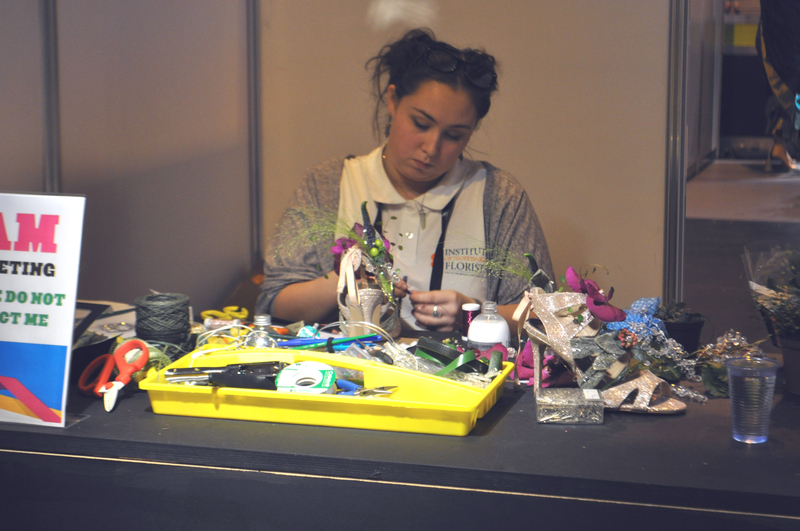 The Skills Show, at the NEC Birmingham, attracted 80,000 visitors. Many colleagues who helped to staff the stand over the three days said that in their opinion it was the best event they had ever attended. Talented Reaseheath College trained landscape gardener Matt Beesley has proved he is among the world’s best by taking silver at the WorldSkills finals in Sao Paulo, Brazil. Matt, from Winsford, and fellow team member Jonathan Gill, from Northern Ireland, achieved Britain’s first ever medal in landscape gardening at the global, Olympics style final last week (finished Sun 16). The pair had to prove their skills and stamina in hard landscaping, plant knowledge and management by building a garden from scratch in four days under the gaze of 259,000 spectators. WorldSkills runs the competition bi-annually for students aged 23 and under to showcase the skills and value of young professionals in industries ranging from construction, engineering technology and transportation to IT, communications and social and personal services. The GB team recorded its best ever performance with 33 medals. Matt, 21, completed his Level 3 Extended Diploma in Horticulture at Reaseheath College in Nantwich in 2012. He now runs his own successful business, Beesley’s Landscapes in Winsford, and employs two apprentices. He first competed in the British selection rounds for WorldSkills while a Reaseheath student and has continued to train intensively as a potential squad member. Another former Level 3 Reaseheath horticulture student is a potential member of the GB squad for WorldSkills 2017, to be held in Abu Dhabi. 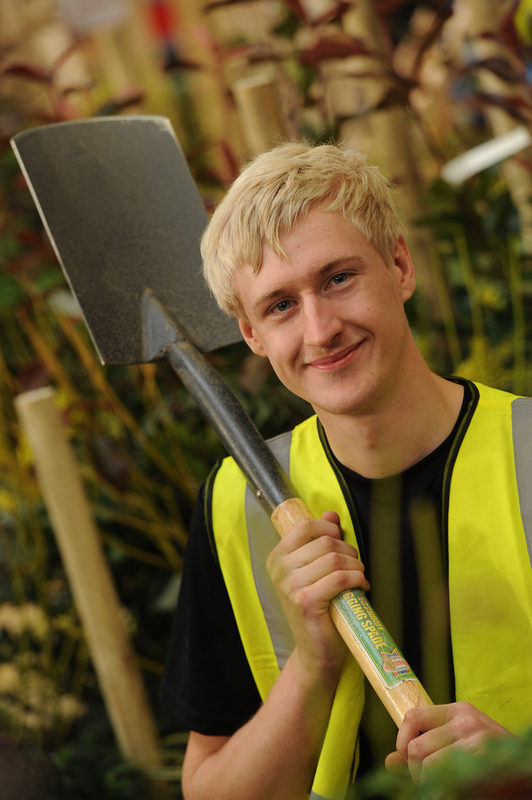 Christopher Shore, who is about to start his Foundation Degree in Garden and Landscape Design, has successfully qualified for this year’s WorldSkills UK national finals. 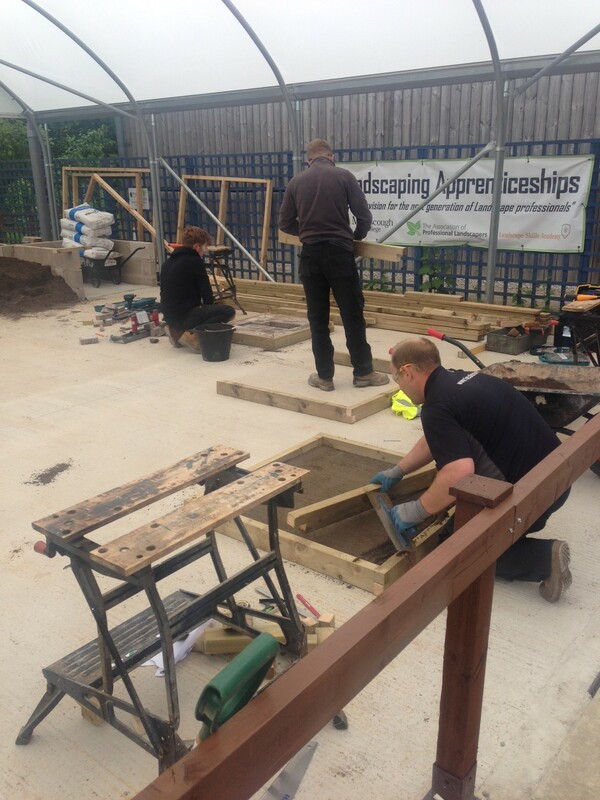 The competition is run by the Association of Professional Landscapers for WorldSkills UK. Pupils from The Dingle Primary School, Haslington, enjoyed the limelight when they appeared on Reaseheath College’s eye catching garden at RHS Flower Show Tatton Park. 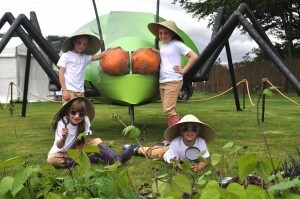 Thomas Atkinson, six, his seven year-old sister Beau, Poppy Beeson, eight, and seven year-old Ruby Deaville, who were dressed as ‘bug hunters’, posed on the garden with a giant aphid for photographers on press day. The flower show, which showcases the best of British gardening talent, was enjoyed by 80,000 visitors before closing on Sunday (July 26). Reaseheath College, in Nantwich, a regular medal winner in previous years, chose this year to put on an educative feature so was not judged in the show garden category. In line with the RHS’s aim to inspire the younger generation into careers involving horticultural science and viable food production, the garden – called ‘The Leaf’, took visitors on an exploration through the structural layers of a leaf and showed how the plant might try to avoid predators. The garden was sponsored by Pochin Construction, who are the contractors on Reaseheath’s £8.5 million national centre for horticulture, sustainability and environmental management which is currently being built. The giant aphid was manufactured by Nantwich firm Harbrook Engineering. 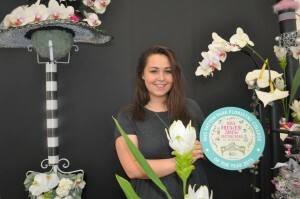 Reaseheath floristry students were also celebrating after winning the RHS Tatton Park Floristry College of the Year Competition for the second year running. The prestigious competition is open to UK based floristry colleges and training providers and showcases the talent of students. Reaseheath’s victorious team were Level 3 Diploma in Floristry students Carol Edgington, Robyn Longden and Rachel Collinson-Fletcher, who were supported by Head of Floristry Sue Poole. The students, who were commended by Chairman of Judges Ian Lloyd for their contemporary design skills and for the impeccable condition of their flowers and foliage, have now qualified for the national finals at the Chelsea Flower Show 2016. 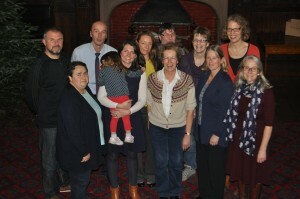 Reaseheath’s student team took the ‘runner-up’ title at Chelsea this year. The challenge at Tatton was to create four designs which represented ‘Musical Through Time’. Reaseheath’s florists chose ‘My Fair Lady’ as their theme and created a hat, a wired bouquet, a buffet table arrangement and an arrangement for the entrance of the theatre. 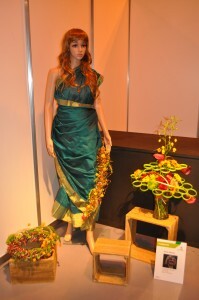 As well as winning the college competition they also won a silver gilt medal for their stand. Three Reaseheath horticulture students also contested the WorldSkills UK Landscape Gardening semi finals at RHS Flower Show Tatton Park. Chris Shore, 20, who has just completed his Level 3 Extended Diploma in Horticulture, qualified for the national finals, to be held at The Skills Show in November. Reaseheath was also one of partners on the Cheshire’s Gardens of Distinction exhibit and ran a series of demonstrations in the Discover and Grow section. Eighty-five students who gained Royal Horticultural Society (RHS) qualifications at Reaseheath this year have celebrated their achievements. Mirroring the national trend, around half are professional horticulturists furthering their development while the remainder are career changers and keen leisure gardeners. Reaseheath is recognised as the leading RHS training and examination centre in the north west and students currently travel from as far as the Wirral, Manchester, Oldham and Church Stretton to attend courses. This year 90 students with a wide age range are enrolled. Reaseheath offers separate theory and practical qualifications at both Level 2 and Level 3. Once both awards are achieved they convert into a well respected RHS Level 2 or Level 3 Diploma in the Principles and Practices of Horticulture. Based in Reaseheath’s new £8.3 million Centre for Horticulture, the Environment and Sustainable Technology, RHS students complete a minimum of 430 learning hours to achieve the diploma. Apart from attending lectures they take part in practical activities in the college grounds and also play a key role in building our show gardens at RHS Flower Show Tatton Park. 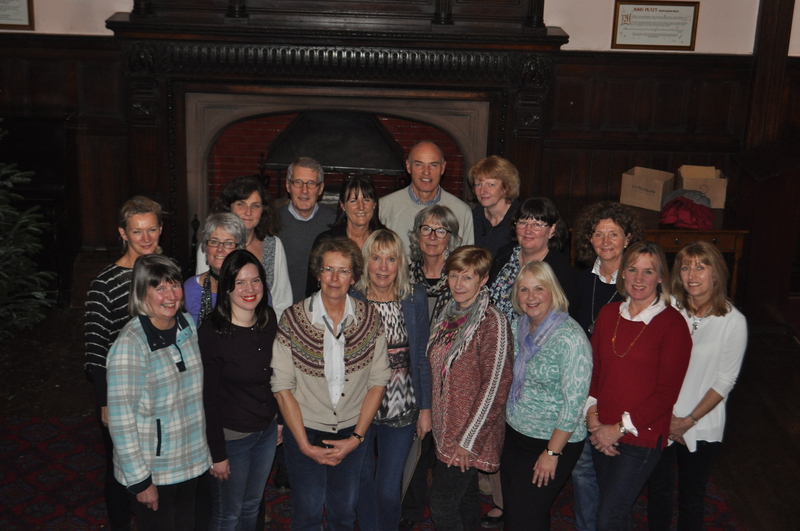 In addition they enjoy trips to outstanding local gardens and many will join a study tour to Barcelona next summer. Head of Horticulture Sarah Hopkinson and RHS Master of Horticulture Harry Delaney, who taught some the students before retiring last year, also attended the ceremony. Reaseheath offers the RHS Level 2 and Level 3 Certificates in Horticulture (theory and practical) as weekly daytime courses and an additional RHS Level 2 Certificate in Horticulture (theory only) as an evening course. 41 students from across the horticulture department have just returned from a study tour of Holland and Belgium, visiting a host of gardens and nurseries. Each group was armed with a team Mr Potato Head to support them with tweeting about their adventures in Holland, accompanied by lecturers Craig Bailey and Carol Adams. Students with their Mr Potato Head! Our first visit, having travelled through the bulb fields of Lisse was 4 hours in the international tourist attraction Keukenhof, boasting with 32 hectares including over 70 million bulbs, over 300 varieties of tulips, orchid exhibitions, plant exhibitions and show gardens. FdSc students and Craig walking on water! Many of the group sheltered in an exhibition hall during our first downpour of the tour and exuberantly joined in the singing and dancing with the dutch band Kleintje Pils who played at the Sochi Olympics! Then we set off to visit the Thijsse’s Hof, a 2 hectare garden home to the native plants of Kennemerland in natural vegetation groups, a pioneer of the naturalistic conservation style of planting. The following day was an early start (6.30am in Holland) taking a trip to the Aalsmeer Flower Auction (Bloemenveiling Aalsmeer), the largest commercial building in the world selling approximately 20 million flowers each day. We travelled along an aerial walkway looking down on the bustle (and near misses) of the warehouses and looked into the auction and testing rooms. We then travelled on to the Nursery Museum in Aalsmeer and were guided through their working exhibitions on rose breeding, Lilac and Viburnum cut flower production, Fruit, Conifer and perennial production systems as well as having a go at bidding on one of the retired auction hose price clocks. The group’s next stop was Amsterdam. Many of us toured the city by canal boat and took a trip to the Floating Flower Market to stock up on unusual seeds and bulbs. Thursday we travelled through the orchard region in Holland to the 26 hectares of De Idee Tuinen (Idea Gardens) in Appleturn, home to over 260 display gardens including conceptual gardens, traditional gardens, water gardens, conservation and green engineering displays and natural play provision. Our final day we visited the Nursery town of Boskoop, calling in at Esveld Nurseries, who are specialists in unusual trees, shrubs and perennials. Good job we all brought small suitcases… customs in Calais guessed which country we had been on tour to… as soon as they opened the boot of the bus and were met by a cascade of plants tumbling out! On our return trip we called into the University of Gent’s Botanical Garden for a stretch of legs and a final top-up of horticultural novelty. The outdoor microclimate and massive glasshouses housed many rare and unusual plant species and we enjoyed looking at their extensive collection of tropical flytraps and exotic food crops, as well as playing with the Sensitive plants (their foliage snaps shut when you brush the leaf with your finger as a defensive mechanism against predators). We arrived back in the UK on Saturday morning at 3.30am and proceeded to ram plants and cases into waiting parents cars…what a great study tour!